So you get to your car and you have a flat tyre. Having a puncture on your car is a pain in the backside, so you pop on the spare wheel and make it to your destination. The next priority is sorting out the pesky flat tyre, this is were you could run into a costly bill if you don’t seek reputable advice. Many tyre centres will simply sell you a new tyre but at A&M Tyres we work to the British Standard — BSAU159f:1990 or Motor Vehicle Tyres Regulations 2003. This means if the tyre can be repaired safely – we repair it. Tyre repairs are kinder on the environment and of course kinder to your pocket too. Before we repair your tyre we check the following to ensure the repaired tyre meets with the Motor Vehicle Tyre Regulations after the repair has been made. 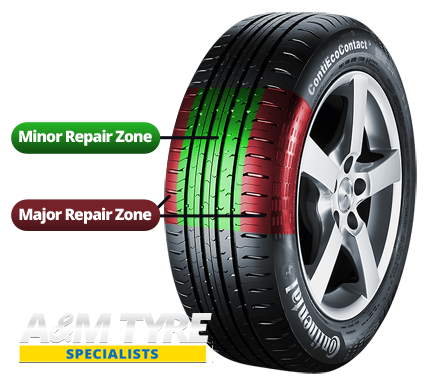 Your motoring safety is the number one priority for A&M Tyres. If the tyre passes the Motor Vehicle Tyre Regulations we get on and repair the tyre. At A&M Tyres we pride ourselves in our quick, convenient and friendly service, our staff will take care of your tyre repair in no time. Once the repair is complete we take off the spare wheel and put back the repaired wheel on the car. So although getting a puncture can be a real pain, A&M Tyres of Wigan work hard to make sure you’re back on the road and safe as quickly as possible.